Also known as the Premier Mine, the Cullinan Diamond Mine, owned by Petra Diamonds, was established in 1902. The types of diamonds that can be mined often range in quality. Diamond mining is one of the leading industries in South Africa. The Cullinan Mine is one of the most famous diamond mines in the world and South Africa’s third richest diamond mine. The underground mine is located in Cullinan, Gauteng province of South Africa. The mine is an open pit of a 32-ha surface area with a depth of about 1,073 meters out of which 747 meters are currently being mined. The kimberlite pipe on which the mine is located resembles a carrot and is one of the largest kimberlite pipes in the world. The mine is estimated to have large reserves enough to last for fifty years. More discoveries of high-quality diamonds are still being made in the mine increasing the importance of the Cullinan mine. Sir Thomas Cullinan discovered the Cullinan mines in 1898 and opened the Premier Diamond mines in 1902. The mine gained international recognition in 1905 after the discovery of the Cullinan diamond. The Premier Diamond Mine was renamed the Cullinan Diamond mine in 2003 during the 100-year celebrations of the mine’s existence. De Beers sold their ownership rights to Petra Diamonds in 2007. Petra Diamonds has plans to expand and modernize operations at the mine through a 16-year plan ending in 2030. 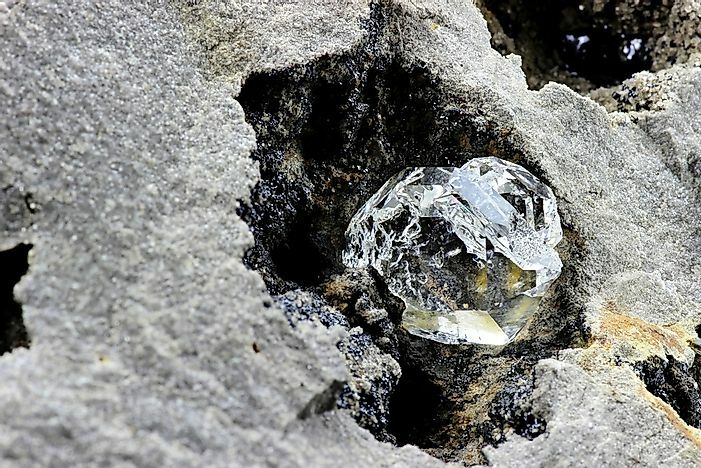 Underground mining methods were used in the mine since 1946, but Petra Diamonds has plans to introduce less damaging and modern cost-effective methods. The Cullinan diamond is the world’s largest rough gem discovered and is named after Sir Thomas Cullinan. The diamond has a remarkable clarity and a black spot in the middle. The black spot is said to be as a result of internal strain within the mineral. The diamond has been used a crown jewel since it was first presented as a birthday gift to King Edward VII of the UK. After its delivery to the King, the stone was cut into three major stones- Cullinan I, II, and III and six other smaller ones Cullinan IV-IX. Cullinan I, II and III are set on the crown jewels The Sovereign’s Sceptre with Cross, the Imperial State Crown and the on the cross pattée of the Queen’s crown respectively. Culliman mine has produced more than 750 stones of diamond that are greater than 100 carats and more than a ¼ of all the world diamonds of more than 400 carats. The mine is the only significant source of blue diamonds in the world. Besides the mining of the Cullinan diamond, the Premier Diamond Mine has large reserves of other world class gems such as the blue and white diamonds. These diamonds fetch a high price in the market with the highest being the $35.3 million USD for the Cullinan Heritage which was sold in 2010. Other important gems from the mine include Premier Rose, The Niarchos, The De Beers Centenary, Golden Jubilee Diamond and the Taylor-Burton Diamond. discover what happens before diamonds are processed into their final shiny appearance.